The Tyent Under-Counter Extreme 9000 Water Ionizer is capable of producing water from 2.0 ph - 12 ph; the strongest in the industry. 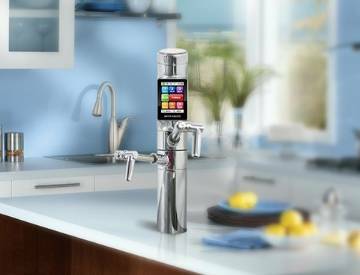 This model features a fully functional electronic touch screen faucet that controls your water output and ph levels. The faucet has a an attractive chrome finish and incorporates a multi-color back-lit screen to assist in using the functions of your Ionizer. Voice guided service commands and warning also help to ensure convenient and easy of use. The UCE-9000T has 9 HUGE plates that boost over 375 watts of power with its Turbo function! Enjoy some of the best ionized, alkaline water. TyentUSA also offers Lifetime Guarantee of performance and satisfaction!